MANILA, Philippines – Ilocos Norte Representative Imelda Marcos lamented the “cruel” treatment that the administration is giving ex-President Gloria Macapagal Arroyo after she paid the former Chief Executive a visit at the hospital. “She was in a good mood, but she’s not well,” Marcos told House reporters on Wednesday, January 22, at the sidelines of a session. 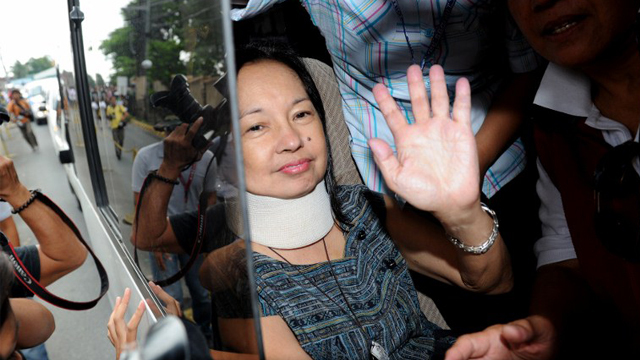 Since November 2011, Arroyo has been under arrest for alleged electoral sabotage for ordering cheating in the senatorial elections in Maguindanao. In October 2012, she was charged with plunder over the alleged misuse of funds by executives of the state gaming corporation during her term. She has not been granted house arrest and has been staying first at the St Luke’s hospital and now at the government’s Veterans Memorial Medical Center due to her spine problem. The court has not allowed her to seek treatment abroad either. The former First Lady scoffed at the policy limiting Arroyo’s visiting hours. “What is worse is that she is only visited by her husband, her children, from the afternoon to 9 o’clock. It’s so cruel. It is so unjust. It is not human,” Marcos said. “I am so sorry, so sad to be there,” she added. 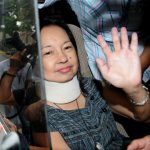 Before this, prominent politicians have been visiting Arroyo as well, including her predecessor, former President Joseph Estrada, whom Arroyo had jailed for plunder as well but immediately granted house arrest and, later, pardon.